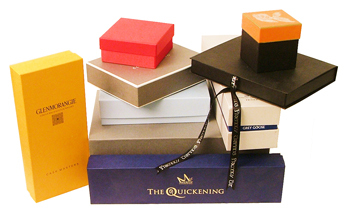 We offer a huge range of rigid boxes for sale for a number of different occasions and uses. Our ranges include jewellery boxes, stationery boxes, photography boxes, gift boxes, drinks presentation boxes and more. Previous clients have used our boxes for clothing, accessories, sample products, cosmetic and beauty products, corporate and home craft products to name but a few. Once manufactured, the boxes are covered in your choice of smooth, textured or luxury finished papers. The boxes can be personalised with a foil blocked logo or a full colour print making them really stand out from the crowd! We will work with you to take your ideas & turn them into reality. We can provide filler material and tissue paper to give an extra touch of luxury to your items. We can also provide packing material to keep your items safe during shipping if required. Our service is truly tailored to suit the client's needs, therefore if there is a particular size or style of box you are looking for then please do not hesitate to ask. All of our boxes are handmade in Irvine, Scotland, UK to the very specific requirements of our customers. There is no minimum order requirement so our range is suitable for smaller companies and larger businesses alike. If you are interested in purchasing from our range of handmade, luxury boxes then please contact us for more information. A member of our team will be on hand to assist you with any enquiries you may have.